Balochistan (Balochi, Urdu: بلوچستان‬‎, Brahui: Balocistán) is ane o the fower provinces or federatin units o Pakistan. Wi an aurie o 134,051 mi2 or (347,190 km2), it is the lairgest province o Pakistan, constitutin approximately 44% o the total land mass o Pakistan. 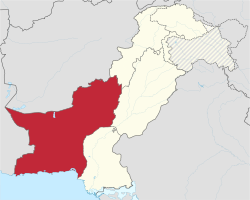 Accordin tae the 1998 population census, Balochistan haed a population o roughly 6.6 million. The lairgest ceety, Quetta is the simmer caipital while Gwadar, the port ceety locatit in the sooth-wast, serves as the winter caipital. ↑ "Population, Area and Density by Region/Province" (PDF). Federal Bureau of Statistics, Government of Pakistan. 1998. Retrieved 2009-07-20. This page wis last eeditit on 16 October 2018, at 05:23.